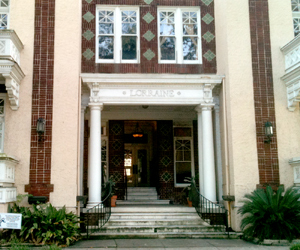 The 91-year-old Lorraine Apartments on St. Charles Avenue have a new lease on life and can move forward with renovations after the city council corrected a zoning problem last week that could have kept the historic building shuttered indefinitely. Built in 1920, the Lorraine was given zoning in 1953 for a two-family residential structure, but as long as the building remained in continuous use, that classification was not enforced. It was bought in 2008 and closed for renovations, but the developers found substantial unexpected problems with its mechanical systems, and the project fell by the wayside. In September, the owners appealed to the City Council, and City Councilwoman Susan Guidry led the effort to overrule the planning commission in the Lorraine’s favor. The zoning change was finalized at the council’s Oct. 20 meeting, and architect Rick Fifield said the projec it is now moving ahead “as quickly as possible,” with the plans nearly finished and the permits likely to be sought in a week or so. The decision was also lauded by members of the surrounding Uptown Triangle Neighborhood Association, who had vocally supported the Lorraine’s renovation. What will be Uptown’s first Taco Bell franchise was enthusiastically given permission to replace a blighted old Pizza Hut building on South Claiborne Avenue. Councilwoman Stacy Head called the project “really exciting,” as it is planned to be incorporated into a larger retail center known as the Magnolia Marketplace. “I hope to see more and more and more of these kinds of things, one more piece of property brought back into commerce,” Head said. The Poydras Home retirement community at Magazine and Jefferson was given permission to add a new building, “fairly grand in scale” and similar to an original building there years ago, Head said. Poydras Home had disputed with the City Planning Commission staff over the layout of parking at the site, and the final plan approved by Head ended up with only two fewer spaces than the owners had hoped for, with landscaping to shield it. The CVS Pharmacy under construction on South Claiborne was given tentative permission for alcohol sales. Head noted that a good-neighbor agreement is still in the works, and the alcohol sales will not be finalized until the agreement is complete, but the council was on deadline and had to make a decision. A Central City property owner’s request to tear down a house in the 2400 block of South Saratoga was denied after Head said a renovation of the cypress-built home should be attempted instead. She said she would give the homeowner a list of contractors who have agreed to conduct historic renovations for less than $80 per square foot, likely less than the estimated $150,000 construction proposed by the contractor. One of the more contentious Uptown issues pending before the City Council, permission for the proposed Johnny V’s restaurant to open with some unapproved additions to the building, was deferred until Nov. 3. The council accepted a letter opposing the project from Webster Street resident Robert P. Roberts. Roberts’ letter also makes an extensive technical argument that the restaurant’s size should require 43 off-street spaces, and that leasing the spaces is an insufficient solution, as the lease could be terminated while the restaurant is still open. Plans to correct a water-infiltration problem at a condo in the 800 block of Washington were also postponed until Nov. 3. Architect Alex Modinger told the council that the solution proposed by the city will cost $100,000, and Head recommended that city staffer take another look at the project to find a better solution. Also deferred until Nov. 3 were a hearing on the controversial demolition of a large home at 5428 St. Charles Avenue and permission for a child-psychology clinic in a home on Maple Street.